One of the masterpieces of dungeon synth. This is an equal challenger to all of Mortiis' work. The album starts of slowly; building upon itself, forming the scene, entering the landscape. Clean choir vocals sing in a rollicking Viking style, with a masculinity, stoicism, and grittiness that can only cause one to picture misty images of those ancient warriors rowing their ships at night, heading to England or mainland Europe to reap destruction. And then it returns briefly to the quiet peaceful wandering. These songs don't quite call one to battle; they are almost more the hazy recollections of an old warrior, nostalgic and beautiful, with the stars brightly shining overhead. The atmosphere of the music really is like that of an old fireside tale, the kind that are thrilling and powerful enough to drive out the worst colds. A myth like this could only be woven by the most respected of the elder story-tellers, the one who wields powers of sorcery that would be both feared and honored. And so this very tale seems to have been imbued with his mystic powers. Fjelltronen is such an incredible album because, not only does it contain, in every inch of it, the fiercely palpable atmosphere of ancient magic, but also it is musically complex and quite finely crafted. It is such a shame that this was the only Wongraven release, though I am much more happy with that state of things than if Satyr were to follow it with inferior material. Unlike much dungeon synth, the emotions vary greatly, often reveling in a hardy melancholy, then to an unknown darkness, then to the main adventurous theme that dominates the music, then to a cheerfully strange wandering, and the album ends with a triumphant conclusion to rival the very best metal in its affirmation of the value of sheer power. Structurally this album is to be greatly admired, both in comparison to the other dungeon synth works which are very primitive in their structure, but also standing alone its structure should be recognized by all listeners as some of the very highest to be found outside of classical. The first track is the introduction and telling of first chapter of the story. The hero is brought out from a comfortable place and into a realm that is frightening and dangerous. In the second track, Over Ødemark, the hero wanders about that landscape. As if in an epic story he is confronting dangers and obstacles along his way, though he has to primarily rely upon his own strength to overcome them. The next song is similar, but instead of being a new obstacle, it is a sort of pleasant moment in between the howling winds. The hero stopped, perhaps at an isolated inn somewhere, and discovered a number of cheerful drinking dwarves. Tiden er en stenlagt grav continues the telling of the larger saga, backing away from the hero's lonely struggles and gives it higher significance and shows us a bit more about the world he's struggling within. Fra Fjelltronen concludes the music in the most beautiful way imaginable, such that no matter how many times I listen to it, I always find myself shocked and usually covered in goose-bumps. 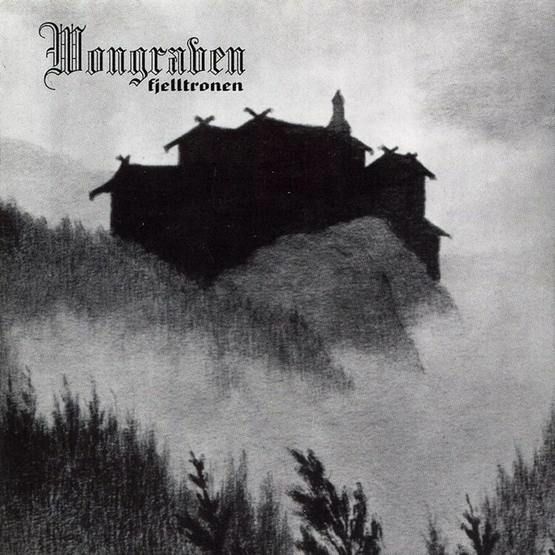 Hearing the song Tiden er en stenlagt grav, one should immediately understand what dungeon synth is about. It's not about keyboards or Tolkien worship, it's about truly taking the listener to another world, one which either has not been experienced since a past we cannot recollect, or has never been experienced at all. Perhaps visualization is important to dungeon synth... Hear the music and try and picture the strange landscapes it takes you to; maybe that's the key to understanding it. It's always been something I took for granted, but no doubt that's not how people are accustomed to listening to music. All I can say is that, for the masterpieces of dungeon synth, the more effort you put into getting it, the more you'll get back in experiencing that world. Fra Fjelltronen brings us back to the beginning of the story, but now with greater context. Suddenly we feel as if the hero of the tales has returned, and of course not only brought back something for the betterment of the tribe, but also has new knowledge of his own that makes him both wise and powerful. And the clean singing voice wraps it up perfectly, seeming to summon forth all the ancestors and all the lost battles and great victories that had been endured to bring the people to the point where they are at the telling of the story. But then it ends, with the chilling voice of some sort of a ghost in the wind. And a bell crashes, tearing us out of our trance and throwing us coldly back into the real world. This ending is done almost like a banishing ritual, thereby leaving the beauty of the music to be found only in that precious half-hour spent with the album, not allowing any of it to escape into the "real" world. This album is much easier to listen to and can certainly connect more deeply with more people than Mortiis (who connects with many, but not on the level that he should). Most who listen to this album honestly will find that it has an almost supernatural ability to place them in a trance, and if they are not utterly moved by that ending, then I think they have no hope of ever understanding what this music is about. If you only ever listen to four dungeon synth albums, make them Crypt of the Wizard, Fjelltronen, Keiser Av En Dimensjon Ukjent, and Ånden Som Gjorde Opprør. I have a question about the very first issue of this CD. It seems that out there we have three different versions which differs for the color printed on the CD (gold, silver and green). Do you know which is the very first one? I'm sorry to say that I do not. And I'm not sure where one would begin looking to find that out, unfortunately. Does anyone happen know what is said at the end of the album before the bell tolls? I asked satyr himself outside of the venue when satyricon played in Worcester Massachusetts. He literally told me he couldn't remember. This has plagued me for more than a decade now. Seems like the vocals are in reverse. I wish that one day I could get the answer from someone... seeing that I couldn't get it straight from the horses mouth... so to speak.